For the game also known as Grand Hazard, see Sic bo. If he rolls a 2 or a 3, he loses (throws out or outs). 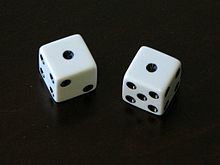 In some reports on the rules of the game, the main is determined randomly by tossing the dice until a valid main appears. In this case the overall player disadvantage is 1.84%. If the caster can choose a main, he should always choose 7 (resulting in the lowest disadvantage, with 1.41%). This is the origin of a similar dice game, craps, since if 7 is always chosen the game devolves into craps. The name "hazard" is borrowed from Old French. The origin of the French word is unclear, but probably derives from Spanish azar ("an unfortunate card or dice roll"), with the final -d by analogy with the common French suffix -ard. The Spanish word has been supposed in turn to come from Arabic, either from the name of a castle in Palestine, or from the word az-zahr (الزهر) meaning "dice". However, early evidence for this word in Arabic is lacking, as it is absent from Classical Arabic dictionaries, making the etymology doubtful (although any other source is unknown). Another possibility is Arabic yasara ("he played at dice"). ^ Steinmetz, John. "The Gaming Table". ^ a b c d e "Hazard". Oxford English Dictionary. Retrieved 11 August 2009. ^ a b c d "Hazard". Online Etymological Dictionary. Retrieved 11 August 2009. Look up hazard in Wiktionary, the free dictionary. Chisholm, Hugh, ed. (1911). "Hazard". Encyclopædia Britannica. 13 (11th ed.). Cambridge University Press. p. 117.